What can I do at my probation interview to get a good recommendation? What can I do at my probation interview to get a good recommendation in my PSI or PSIR (Pre-sentence Investigation Report)? Dressed as if you are going on a job interview. Never wear revealing clothing, jeans, shorts or other similar casual clothing. You do not want your breath to stink. Seems like a no-brainer but you would be surprised! Probations officers are looking for signs of drug or alcohol use. Fill out all documents provided by the probation department prior to the interview. Write very clearly and get help from your lawyer if you have any questions. If you have family, friends or coworkers that are able to write letters of support for you, bring them to the probation interview. Make sure your lawyer gets a copy well in advance so that he or she can make any necessary suggestions. If you are seeing a probation officer for a pre-sentence interview, chances are you’ve been convicted by trial or plea (guilty or no contest). The probation officer will positively consider genuine remorse. Probation officers are used to being insulted and demeaned. Treat the probation officer as you would a potential employer during an interview for a job that you really want. Taking responsibility doesn’t work when you blame others at the same time. Don’t say that someone else made you did it, that the police were lying, or that the drugs or poverty are to blame. Nothing blows a good first impression like being let to an interview. Be very early and just bring reading materials to keep yourself entertained while you wait for your appointment. If you follow these simple guidelines, you should do well at the probation interview. Because each case is different, you should always take the time to speak to your lawyer before the interview to make sure you are handling everything just right. If you need help or have questions, it would be best to contact a criminal defense attorney. 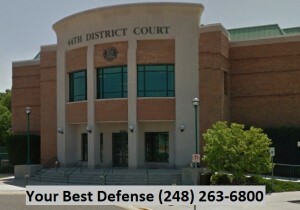 Please call us at (248) 263-6800 or fill out our Request for Assistance Form to speak to one of our attorneys. we’re not afraid to win!